YUKON RIVER — "She's starting to wail," Chris Florian says, referring to the worrisome shriek of a peregrine falcon across the river. After hearing rumors of them being just ahead of me for several days, I finally caught up with Ambrose and Florian on my canoe trip from Eagle to Circle. I have heard about Ambrose's work for years and am glad to see him in action. 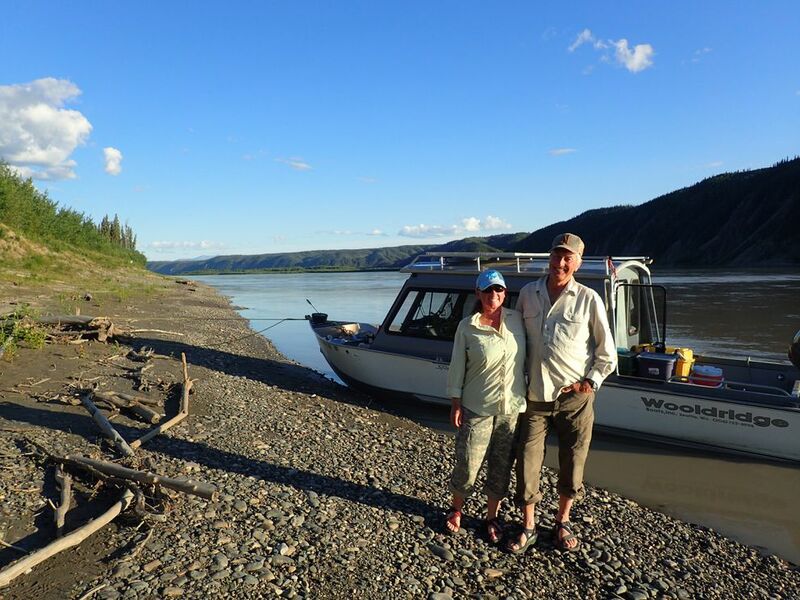 Since 1973, Ambrose has made the same 180-mile trip up the Yukon River from the town of Circle to the Canada border, missing only two years. He has then reversed course, and motored and drifted on the current back to Circle. He does this to double-check the terrain; he starts traveling upriver because if he has boat problems, the Yukon will bring him back to Circle. Ambrose, who with Florian now owns a home in Utah but is moving back to Alaska, takes this journey twice each summer: once in late May to early June, and another in July. The early trip is to see which cliffs have pairs of falcons, and also to see which ledges overlooking the river they are using for nesting. 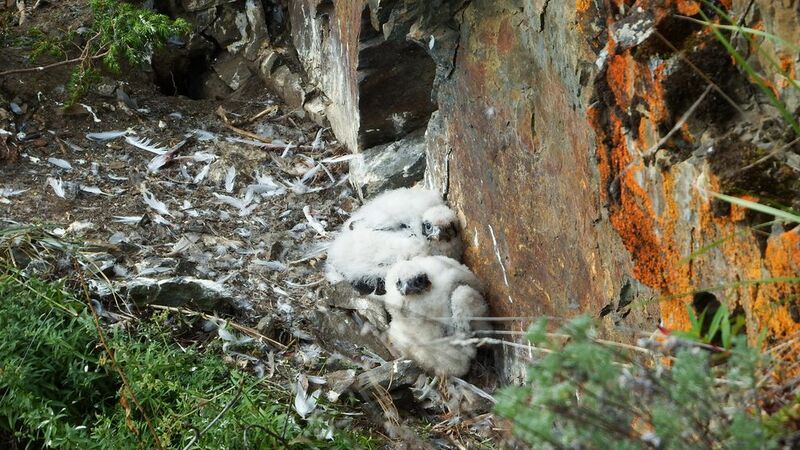 They already know this: Peregrine falcons are nesting in 62 steep places on Alaska's upper Yukon this summer. 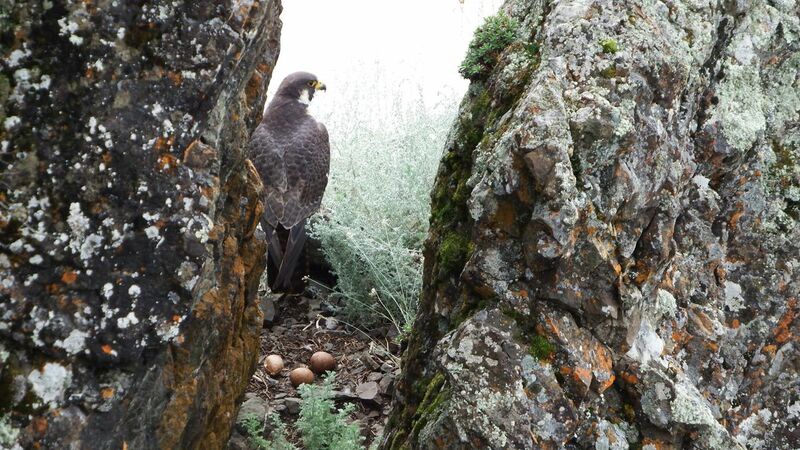 Though most scientists' research on the American peregrine falcon ended after the bird was removed from the endangered species list in 1999, Ambrose continued looking at upper Yukon birds. The U.S. Fish and Wildlife Service funded his observations from the late 1970s until the birds were de-listed, then the U.S. Air Force gave money to support Ambrose's work for a few years. The National Park Service hired Ambrose to monitor the birds until eight years ago, when he continued at his own expense. "We bought the boat because we just like doing this work and we think it's important," Ambrose says. In a scientific world of two-year degrees and need-driven government studies lasting a few years, observations like Ambrose's or George Divoky's 44-year study of black guillemots north of Utqiagvik are rare. Ambrose and Florian think the real stories might just be unfolding. "No one's ever put intense observation into a recovered population," Ambrose says. "The more you know, the more you realize how little you know." "Over the last 3 years, we observed injured adults at 5 locations, something we never observed in previous years," he wrote. "All the injuries were leg or foot related, and we suspect these were the result of interactions with other peregrines." "Every year we find a sidelight we never expected," Ambrose says.